Where do I use my The Baby Room voucher code? "Sign up to The Baby Room to have all the latest news and exclusive offers delivered straight to your inbox." Established back in 2003, The Baby Room has now curated over 14 years of expert experience and have secured a prestigious reputation as an independent retailer of babies and children’s luxury brands. 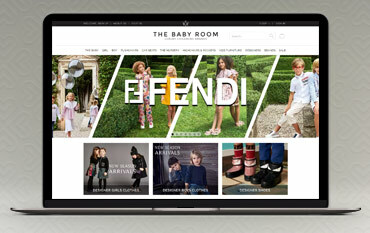 The friendly team focus on nursery goods, babies, children’s designer clothing, footwear and furniture and boast an exciting array of kid’s brands featuring the likes of Maclaren, Kenzo, Fendi and so many more across a huge selection of categories. Preparing for the arrival of your little one is a super exciting time, and at The Baby Room, they want to ensure you’re fully equipped with the best and latest goods to welcome your little one into the world. The Baby Room is the ultimate destination for prams, pushchairs, car seats, nursery furniture, high chairs, designer clothing and interiors all supplied from globally sourced brands. Every season The Baby Room brings you the best and carefully selected childrenswear and footwear from birth up to 16 years boasting prestigious international designers. You can also grab premium branded furniture from Europe's leading designers and manufacturers so you can create your baby’s dream bedroom, nursery and wardrobe all from one place. The Baby Room is pleased to offer those all-important finishing touches which include a wide range of premium mattresses, wallpapers and bedding. Shop the premium collection today and don’t hesitate to grab a superb saving online from our deals page right here and get more for less when you shop online at The Baby Room. At The Baby Room, you can shop over 50 luxury brands across a wide range of products including designer childrenswear, nursery furniture, pushchairs, car seats and so much more! Boasting an impressive array of designers and big named brands including Bugaboo, Egg, Moschino, Cybex, Roberto Cavalli and many, many more, you can rest assured you’re in the best hands for first-class designer products online. Simply select the designer or brand you would like to shop from and enjoy. If you have an eye for luxury, The Baby Room is your one-stop shop for the most prestigious baby furniture, clothing and accessories online so what are you waiting for? As an independent, luxurious brand catering for babies and children, The Baby Room boasts a prestigious collection of products including clothing, pushchairs, car seats, highchairs and rockers, kids furniture, nursery furniture and so much more. Shop some of the most luxury brands including Egg, Bugaboo, Joie, BabyStyle and so many more! Using one of our Baby Room Voucher Codes, you can make great savings when you buy products online making your shopping experience even more enjoyable. Discover what The Baby Room can do for you for less today.